Riashnie Thaver is proof that good things do come in small packages. 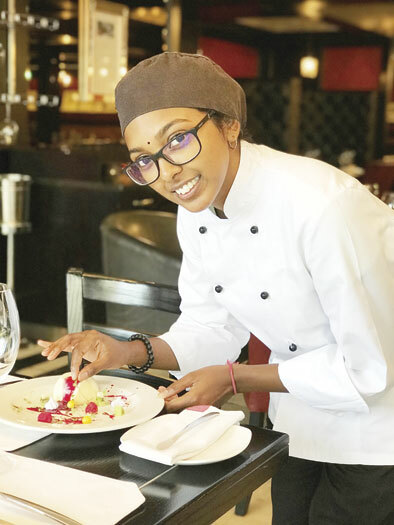 The energetic 19-year- old commis chef at Durban’s iconic Southern Sun Elangeni and Maharani Hotel’s Grill Jichana restaurant has been working her magic in the kitchen, so much so that she has been selected to participate in the seventh annual Distell Inter Hotel Challenge. Enticed by aromatic flavours and intricacies of food preparation, Thaver, was drawn to the kitchen from an early age, which sparked her passion for the profession. “I come from a very supportive family with big flavour, so it was years and years of watching my mum and grandmother prepare dishes in our kitchen or over an outdoor fire that reeled me in. I was always intrigued by the way they cooked, with lots of passion and lots of love,” said Thaver who matriculated with top honours at Durban Girls High School. She explains she was in a position to choose any career put forward to her, but she chose to follow her passion. “I am determined to break stereotypes, and encourage more youngsters to do what they love. I was expected to follow a career in accounting but thanks to the support of my parents, my dream became a reality,” she said. Even though her first few month’s at the hotel’s kitchens were gruelling, Thaver persevered and was determined to make an impact on her superiors by getting them to notice her ability. After a year of hard work, passion and dedication at Grill Jichana, Thaver has been recognised as one of the hotel’s talented rising culinary stars destined for success. truly am. I create combinations unimaginable such as tequila caviar, white chocolate spaghetti with chocolate brownies smothered in wild berry compote. This is a play on spaghetti and meatballs in a dessert form,” explains Thaver. She adds that her favourite ingredient that she cannot cook without is butter. “It makes everything taste like a warm hug. Pure, authentic real butter! It enhances the natural flavours, adds richness to a dish and is a very versatile ingredient. It can find its way into every dish,” she said.